As glycaemia and the incidence of microvascular diabetes complications follow a log-linear relationship, it becomes increasingly difficult to demonstrate a microvascular benefit of glucose-lowering when the HbA1c level is close to normal. The Outcome Reduction with an Initial Glargine Intervention (ORIGIN) trial randomised 12,537 people with diabetes, impaired glucose tolerance or impaired fasting glucose to receive standard glycaemic care or standard care with the addition of basal insulin glargine (A21Gly,B31Arg,B32Arg human insulin), targeting a fasting plasma glucose level ≤5.3 mmol/l. Microvascular outcomes during a median follow-up of 6.2 years were examined in participants whose baseline HbA1c was above or below the median of 6.4% (46.4 mmol/mol). Allocation to the insulin glargine group reduced the incidence of the primary microvascular composite outcome of kidney and eye disease in participants whose baseline HbA1c level was ≥6.4% (46.4 mmol/mol; HR 0.90 [95% CI 0.81, 0.99]) but not in participants with a lower baseline HbA1c (HR 1.07 [95% CI 0.95, 1.20]; p value for interaction 0.031). 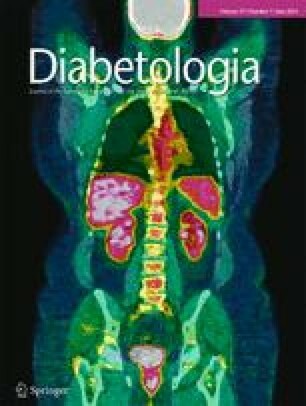 In people whose baseline HbA1c level was ≥6.4% (46.4 mmol/mol), the median post-randomisation change in HbA1c was −0.65% (interquartile range −0.16, −0.91%) after allocation to insulin glargine and −0.33% (−0.83, 0.13%) after allocation to standard care (median HbA1c difference 0.33%; p < 0.0001). A smaller median difference of 0.22% was noted in people whose baseline HbA1c was <6.4% (p < 0.0001). In patients with dysglycaemia, intervention targeting normal fasting glucose levels reduced HbA1c and attenuated the risk of microvascular outcomes in participants with a baseline HbA1c level ≥6.4% (46.4 mmol/mol). A neutral effect was seen in those with a lower baseline HbA1c level. The online version of this article (doi: 10.1007/s00125-014-3238-4) contains peer-reviewed but unedited supplementary material, which is available to authorised users. The ORIGIN trial was funded by Sanofi, who also provided regulatory support, site monitoring and insulin glargine. Pronova Bio Pharma Norge supplied the n-3 fatty acids supplements and placebo. REG received consulting and lecture fees from Sanofi, Merck, AstraZeneca, Bristol-Myers Squibb, Eli Lilly and Boehringer Ingelheim and other funds through his institution from Merck, AstraZeneca and Bristol-Myers Squibb. JFEM received consulting and lecture fees from Abbott, NovoNordisk, Novartis, Amgen, Roche, and Boehringer Ingelheim and other funds through his institution from Roche, Celgene and the European Union through framework-7 grant SysKid 241544. GS received consulting and lecture fees from Eli Lilly, Merck, AstraZeneca, Novo Nordisk, Novartis, Sanofi-Aventis and Servier, and research support from Novo Nordisk. MH received speaker honoraria from Takeda, Glaxo SmithKline, Roche, Bayer, Eli Lilly and Sanofi and advisory board honoraria from Sanofi, Takeda, Bristol-Myers Squibb and Glaxo SmithKline. SY received consulting and lecture fees and grant support from Sanofi. HCG reports consulting and lecture fees from Sanofi, Bayer, Merck, Glaxo SmithKline, Roche, Novartis, Janssen, Abbott and AstraZeneca and other funds through his institution from Sanofi, Merck, Novo Nordisk, Eli Lilly and Boehringer Ingelheim. JB reports no duality of interest associated with her contribution to this manuscript. The work presented here was undertaken in collaboration between all authors. REG and HCG defined the research idea, designed the study’s methodology and wrote the report. REG, HCG, JFEM, MH, GS, JB and SY contributed to the data collection, study design and discussion, review and editing of the report. All authors have seen and approved the current version of the report. HCG is responsible for the integrity of the work as a whole.